In these lessons, I will continually refer to your “studio.” This doesn’t mean you need to have a professional artists’ studio! This can be your garage, basement, spare room—wherever you will feel comfortable creating. We briefly discussed studios in our Choosing Your Paint lesson. We’ll get into more detail about selecting your work space in this lesson. Jackson Pollock and his wife, Lee Krasner, found a house for sale in East Hampton while visiting some friends. The price of the house was $5,000 and Peggy Guggenheim gave them $2,000 for the down payment in exchange for paintings. 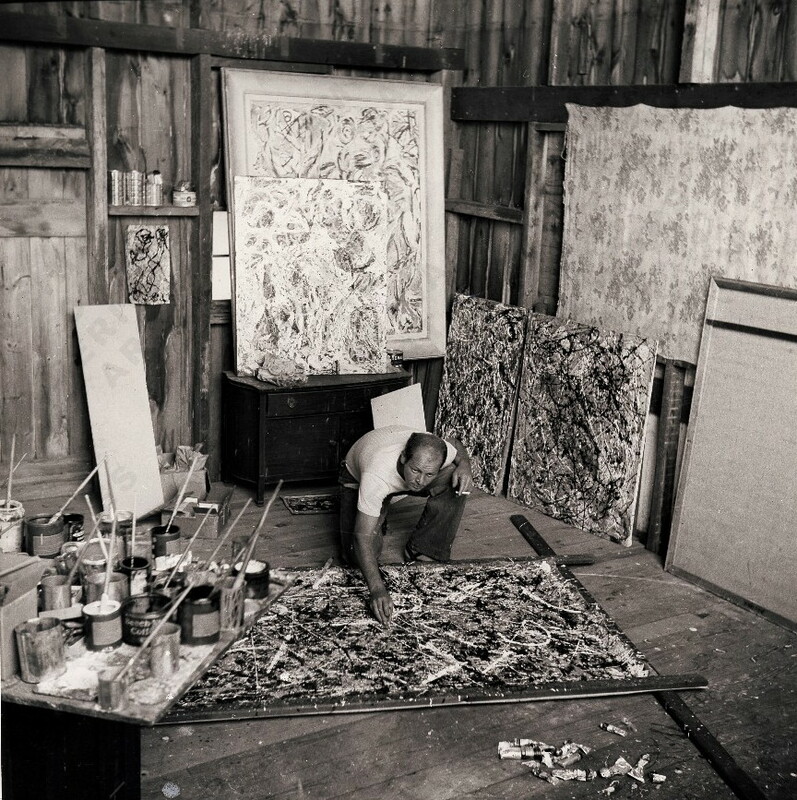 Eventually, Pollock used the barn as his studio. Claude Monet had his first studio in a barn next to his home in Giverny. 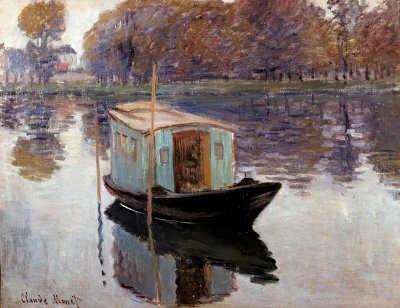 After he moved to Argenteuil, he bought a boat and converted it to a floating studio. He kept the boat moored near his home and used it to get a vista of the riverbank from the water. 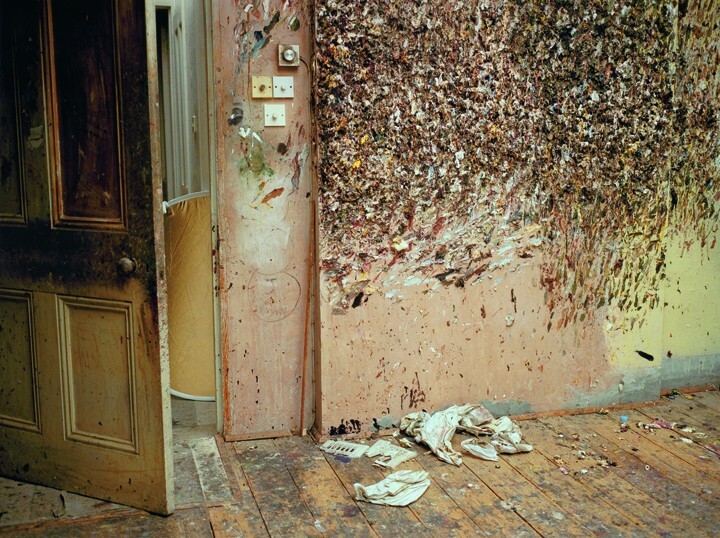 Looking at this reminds me to tell you: you will get paint on you/your floor/table/easel/cat at some point. It’s inevitable (trust me). So be sure to wear some clothes that you don’t mind getting paint on, or wear an apron. If you don’t want to get paint on your floor, try throwing down a drop cloth or a tarp (but be careful not to trip!). You can cover tables with newspaper or butcher paper to keep the paint off. 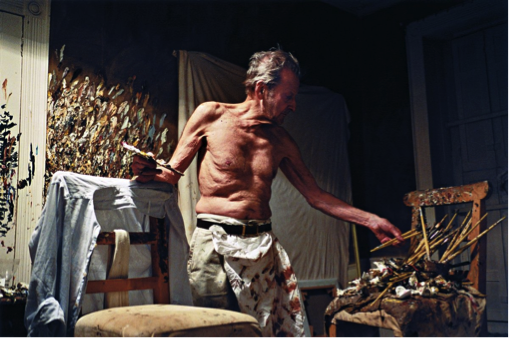 If you are fortunate enough to have a dedicated studio space, you may not mind paint on the floor—Lucian Freud obviously didn’t care too much. My personal studio has paint on every imaginable surface except the ceiling and I usually end a painting session with paint on my face somewhere and yes—on a few occasions—the dog as well. Be sure to consider the input of other household members’ once you’ve narrowed your choices to a few possible work spaces. You can see more studio examples if you want here. Here, we will summarize the difference between traditional oil paints and water miscible oils (WMOs) so you can choose which one to work with before you do your shopping. Traditional oil paints are thinned out and cleaned up with solvents. Many artists use turpentine as a solvent, but it releases toxic fumes and should only be used in a large, well ventilated area. We recommend using Gamblin’s Gamsol—it is 100% refined odorless mineral spirit and requires very little ventilation; all the smelly, hazardous fumes have been removed. Still, you should have at least one window open to the outside to bring in some fresh air. Water miscible oils are oil paints that can be thinned and cleaned up with water. If you’re concerned about using solvents, then you can use water miscible oils to achieve the same look as traditional oil paints but without the solvents. They work the same way as oil paints—all the techniques are the same—except that they dry slightly faster than traditional oil paints and tend to be a little more stiff and “sticky” in their handling. You will need to purchase mediums that work with water miscible oils (regular linseed oil won’t work, for instance). While eliminating solvents makes WMOs less toxic, mediums and pigments can still be toxic, just like with traditional oils. You can also paint with oils en plein air. This means your studio workspace is outside! En plein air is a French term that means “in the open air.” A lot of artists will paint landscapes outside from observation (looking at the real thing, not using a photograph as a reference). See our Painting En Plein Air With Oil lesson for more about this. Determine whether you’ll use traditional oil paint or water miscible oil paint. In Choosing Your Paint, we went over minimum size requirements for studios. In case you forgot, here’s what we said about oil paints: Tabletop with approx. 24 inches square of free space (for use with tabletop easel) or approx. 48 inches square for standing easel and side table for solvent and rag. Unless you use Gamsol or solvent alternatives like linseed oil (see Safety in Oils for more information), your studio area needs large windows that open to outside for ventilation. A fan is also helpful. When you’re first starting out, it can be rather intimidating to have someone looking over your shoulder while you’re trying to learn. Try to find a space where you’re not being watched/bugged every 5 minutes (art takes concentration) or try to establish a little “private” time so that you’re free to create and not answer the door for UPS/take the dog outside/etc. for a while. You can pretty much work wherever you want, but since you are using oils, stay away from the kitchen if at all possible. A lot of paints have harmful chemicals in them (especially oil paints) and should not be used in the kitchen or a bedroom. You don’t want to spill turpentine on the cutting board then make dinner there too. Also, don’t eat, drink, or smoke in your studio because you don’t want to ingest any chemicals. This can be difficult, we know, but if you’re hungry, take a break and eat somewhere far away from your materials. As we talked about in Safety in Oils, to learn more about the elements in your paint and how they might affect you, read the label or check out the Material Safety Data Sheet (MSDS) online. www.MSDS.com has over 3.5 million data records detailing the chemicals in everything from household cleaners to your paint. You can look up items by their product number or keyword on the MSDS site. Obviously you want to be comfortable when you’re working, but before you grab that cushy chair, you may want to consider standing. This is typical for artists to do, mainly so they can gain better perspective (i.e. stepping back to look at the work). 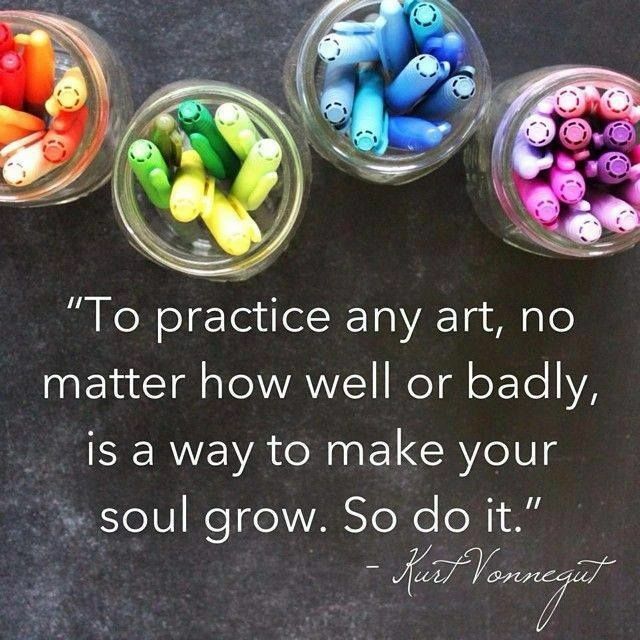 It also helps prevent the artist from painting with their nose on the canvas. If you sit hunched over your work, after a while you will notice that you’ve gotten increasingly closer to your painting. Not only does this hurt your neck and back, it also prevents you from taking in the entire composition. Working up close to the painting, you’ll worry over tiny little details instead of looking at the broader picture. I sometimes setup my artwork in the doorway and back up down the hallway to look at it, or put it on top to the fireplace mantel and look through a doorway into the living room. The other trick that works well is using a mirror. 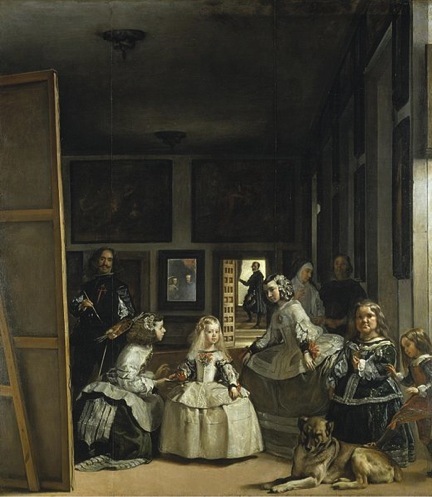 I’ll bring my painting into the bedroom and stand as far back from the mirror as possible. This ends up doubling the viewing distance and has the added benefit of letting you see your painting in reverse, which can sometimes highlight composition problems. Being organized is key so you don’t waste studio time looking for your materials. If you can swing it, try to have a place to work where you can leave your materials set up so you don’t waste precious creating time setting everything up! If you can’t do this, then try to store things efficiently so you minimize your set up time. 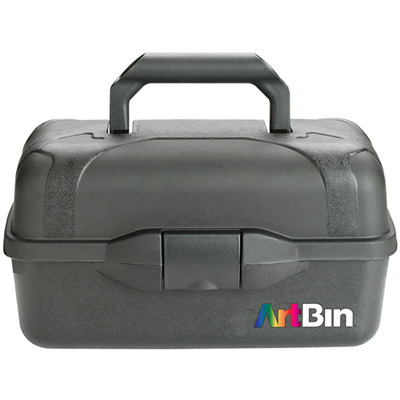 Have all your materials in one place (water dish/solvent can, rags, brushes, paints, etc.) so you’re not running around the house trying to find everything you need. 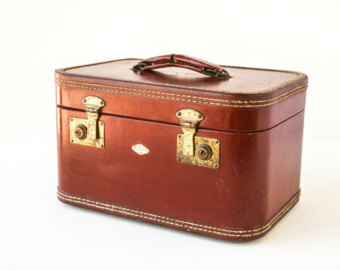 I use an old suitcase (like the one pictured below) to hold all my paints and brushes. These are nice because they have both large and small compartments for organization. Of course, an empty cupboard or dresser drawer will work just as well. Squeezed out leftover paints can be stored in an airtight container in the freezer (an old Tupperware container will do just fine). Your paints will stay soft and you can continue to use them the same way as you would paint fresh out of the tube. This way, you’ll waste less! 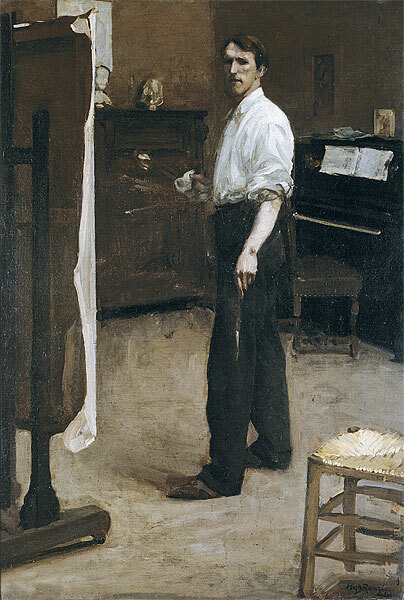 This is always the hardest part for painters—figuring out what to do with all your paintings! Unless you’re hanging them on your walls, giving them as gifts, or (what professional artists hope for) selling them like crazy, you’ll need a place to store your work. 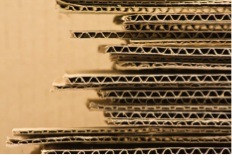 Ideally, canvases should be stored upright right next to each other instead of laying on top of each other, which can cause them to sag or dent. 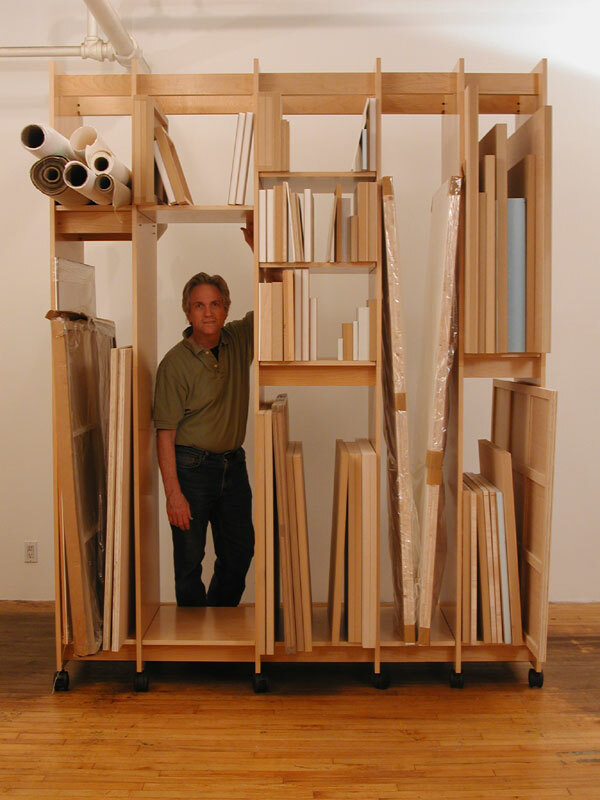 This is a typical canvas storage unit for a professional artist. 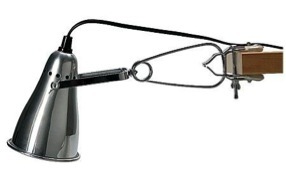 You don’t need to invest in one of these just yet! Find a shelf in the garage where you can stand the paintings upright. 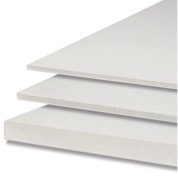 If you only have space to lay the canvases down, you’ll want to put a piece of cardboard or foam core between them to prevent damage to the canvas. You’re going to be watching tutorial videos as you’re painting, so you’ll want to have a computer or smartphone and internet access in your studio. We recommend for all our videos that you watch the video first all the way through without attempting to paint along, then read the text, and finally watch it a second time while painting. The videos should be watched in full screen whenever possible. Important note: We spent a lot of time trying to make the Closed Captions on our YouTube teaching videos as accurate as possible. We hope this allows those students who do not understand English to more effectively convert the Closed Captions into their language of choice. Of course, we realize any translation will not be completely accurate, but we are hopeful that the translation, combined with the video, will allow anyone in the world to understand the videos and thus take all of the Beginner’s School courses. It’s nice to have access to a computer even if you’re done watching our tutorial videos just in case you need a reference image or have a quick question about something. The one problem with having a computer and internet access in your studio is that is can be very distracting. If you choose to have this in your studio, make sure you’re not wasting all your studio time on Facebook! 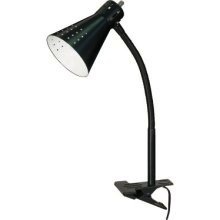 These clamp lights are also good if you’re setting up a still life and need consistent light for the composition. 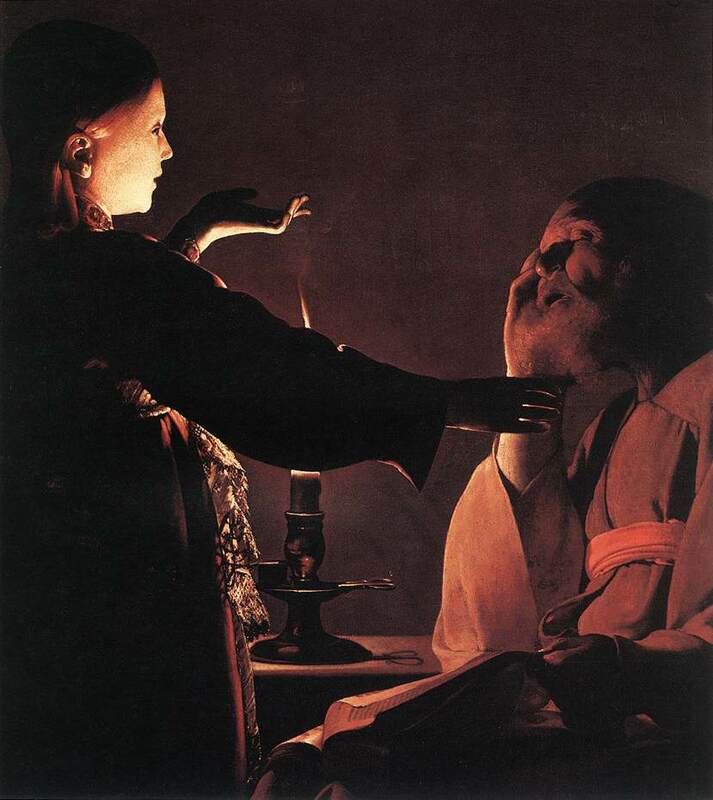 Artists like Georges de la Tour used candles to light not only their work but also their subjects. 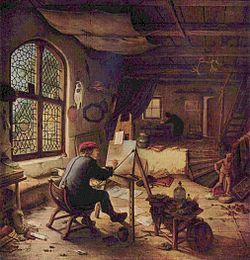 De la Tour is famous for his use of candles in paintings. He suggests using a light bulb around 5,000K, which emits a white light instead of something more towards orange or blue. Using too orange or too blue of a light will change the way you see your paint and could land you a result you’re unhappy with! You should feel comfortable in your space! Play some music that makes you happy. Hang up an inspirational picture. Throw a pretty tapestry over the door. Whatever you need to do to make the space personal and comfortable, do it. 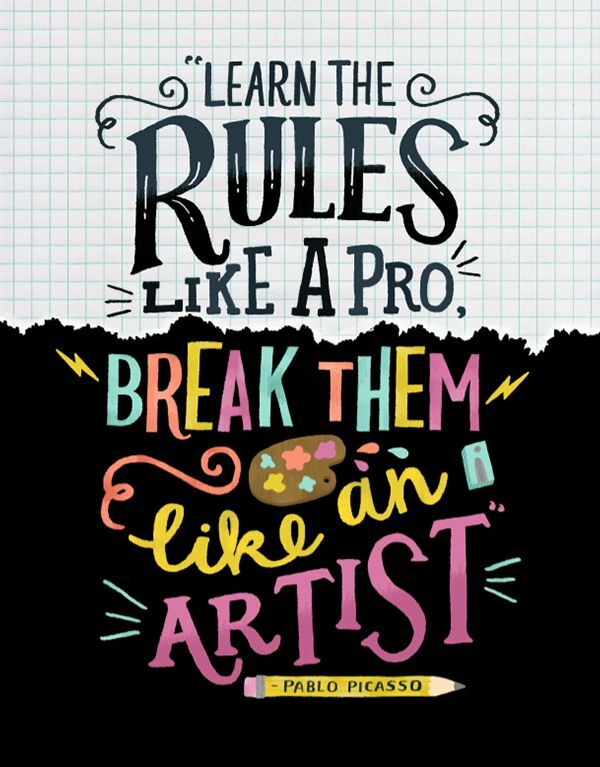 You will have a good time creating if you’re comfortable and you’re less likely to get frustrated with what you’re doing. So bring in some positive energy and make that space yours! Taking into account the considerations discussed in the lesson, choose your studio space. If you’re going to keep your studio in your home, you may need to talk to your roommates/parents/significant other about where you will set up. If you’re going to rent a studio space, come up with a list of considerations to ask the landlord before you start shopping. Remember that you may end up spending a good deal of time in your work space, so make sure you choose a space that is conducive to that (do you have easy access to a bathroom? someplace to eat? running water?). If you ever consider renting a studio/work space, see our article on that in the Student Resource Center here. If you do decide to rent, come up with a list of considerations to ask the landlord before you start looking after you read the article in the SRC. Go around your house and find three things that will make your studio space feel comfortable for you. It may be a vase of flowers (as Monet always had in his studio) or a motivating poster. Think about the music you’ll enjoy painting to. Psychiatrist Carl Jung said that it’s wise to develop a “personal ritual” that puts you in the right frame of mind for your creative undertaking. For example, if you set up the same way everyday—lay out your colors, prepare your brushes, light a certain way, turn on the same “special music”, etc. –this ritual instills in you a conditioned response that says, “Okay, now is the time to paint.” This really helps you with the most difficult part of painting—getting started. The second most difficult part of painting is quitting once you’ve started! Follow us on Pinterest @BeginnersSchool for more inspiring quotes like these! Key Lesson Learnings: We’ve covered a lot in this lesson. We’ve talked about and helped you select your work space, and given you some painting tips. 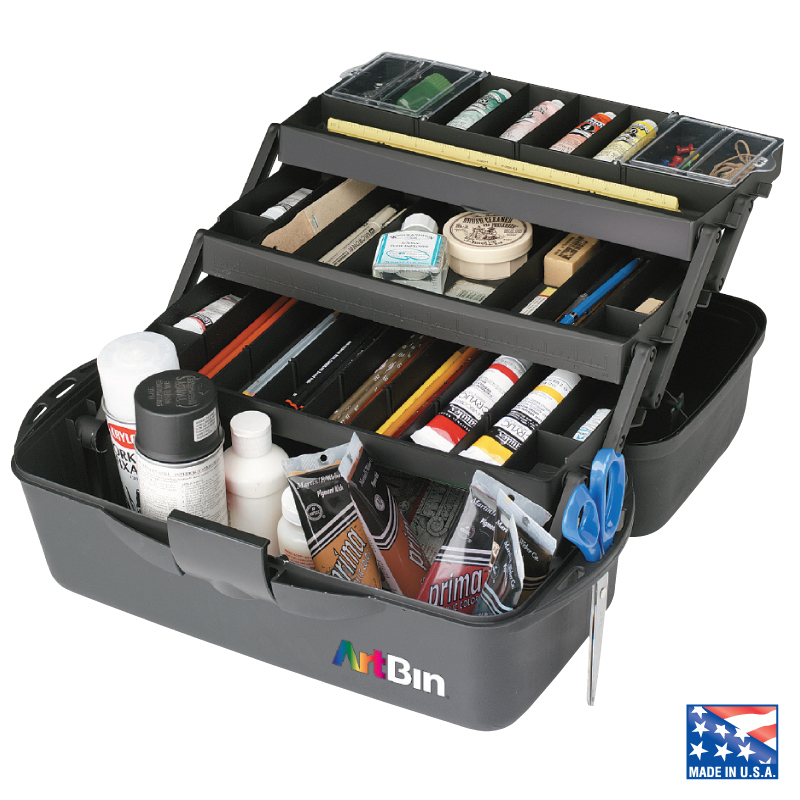 We stressed the importance of keeping your supplies organized to maximize your oil painting time. Next lesson: Oil Supplies And What Do I Need?